System Restore is an important feature of Windows operating system since Windows XP that protects system files from corruption, conflict or accidental deletion. If something goes wrong, user can always restore the computer system files to an earlier point in time to undo the system changes without affecting your personal files, such as e‑mail, documents, or photos. In addition, System Restore uses System Protection feature to regularly or manually create and save restore points on your computer, which not only saves the computer’s system files and settings but also saves Previous Versions of files that you’ve modified, allowing you to undo and recover any wrongly edited or accidentally deleted files and documents. Thus, it’s important to ensure a regular creation of snapshots of System Restore, especially in view of Previous Versions feature, which works better with regular and frequent restore points creation to ensure multiple changed versions of files are saved regularly. Windows XP: Every 24 hours. Windows Vista: 24 hours after last created restore point. Windows 7, Windows 8, Windows 8.1, Windows 10: 7 days after the last created restore point. Newer version of Windows has long gaps between restore points creation interval. The long delay in new automatic restore points creation is not entirely helpful especially in the case of Previous Versions, where regular backup for files that frequently changed is recommended. Windows uses the built-in Task Scheduler to trigger and start the System Restore to create a restore point. 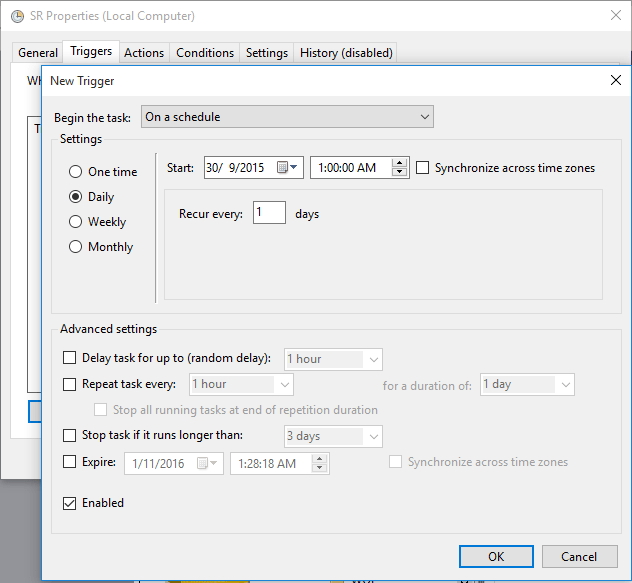 By editing the trigger in Task Scheduler, we can change the schedule and how often the System Restore creates restore points. System Restore obeys registry settings that define how fast new restore points can be created, i.e. Windows creates new restore point only if there is no recent restore point that was created within the time period configured in registry. If you found the message similar to the following in Event Viewer, check out the guide on how to change System Restore absolute time interval at which scheduled system checkpoints are created. Skipping creation of restore point (Process = C:\WINDOWS\system32\svchost.exe -k netsvcs; Description = Windows Update) as there is a restore point avaliable which is recent enough for System Restore. Start Task Scheduler by searching in the Search box. Alternatively, go to Control Panel -> Administrative Tools. 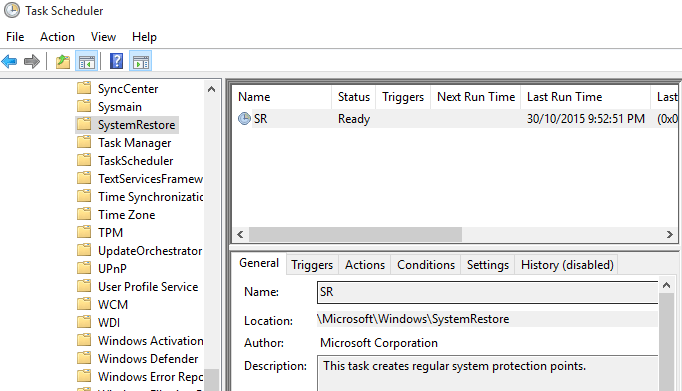 Expand Task Scheduler Library -> Microsoft -> Windows -> SystemRestore in the tree on left pane. A single task named “SR” is listed. Double click on the line of SR task to edit the properties. In the “SR Properties” dialog, go to Triggers tab. Change (by selecting an existing trigger and choose Edit) or add (by selecting New) triggers which will run and create restore point automatically on the predefined schedule. By default (depending on version of Windows), SR task is run at startup, and/or at midnight every day, or no trigger defined at all. Set when to begin the task, where on a schedule allows you to choose the time of day that the task will run, and its recurrence frequency (daily, weekly or monthly). If you choose to run System Restore at startup, it’s also recommended to set the task to delay for up to (random delay) of several minutes so that it won’t slowdown the boot up process. Make sure the Enabled check box is selected so that the task is active. You can use multiple triggers to run System Restore to create restore points at various time. If required, you can set the SR task to start the task only if the computer is idle for a certain amount of time, and/or start the task only if the computer is on AC power, and/or wake the computer to run this task, and etc. These settings are available in Conditions tab. Voila, now you have the restore points automatically created at your preferred schedule and intervals. Note that the restore points are also automatically created when installing or uninstalling software applications, device drivers, Windows Update, or you can also manually create a restore point.